Experience unimaginable family fun, as amazing performers from around the globe perform awe-inspiring feats of daring, spectacles of strength and thrills of wonder in an unforgettable family night of legendary proportions! Ringling Bros and Barnum & Bailey Presents Legends! 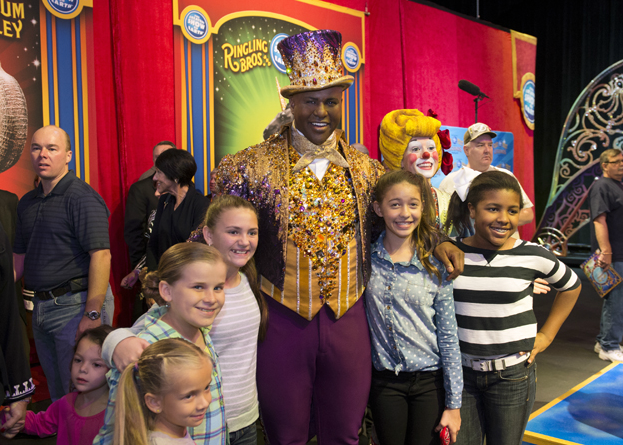 An hour before show time, families can come to the arena floor and participate in interactive, up-close circus experiences, the All Access Pre-­show and the brand new Ringmaster Zone. Also free to all ticketholders, the All Access Pre-­show allows circus fans to learn juggling and balancing skills, meet the performers of The Greatest Show On Earth, get autographs, take photos and enter to win a one-­of-­a-­kind Pachyderm Painting. The boys love the circus and have been attending for many years. We all love the elephants! And the tightrope walkers! And the cotton candy! Ringling Bros. and Barnum & Bailey presents LEGENDS in Chicago November 6–16 at the Allstate Arena and November 19 – 30 at the United Center. Click here to purchase tickets for a Ringling Bros. and Barnum & Bailey performance in your area! Win 4 tickets to opening night at the United Center by leaving a comment below telling me your favorite circus memory and leave an email so I can reach you when you win! This giveaway ends November 12, 2014. We took our son last year for the first time and seeing his face light up is my favorite memory. It was fun to see his reaction to the acts. Would love to take him again! Never been to the circus but would love to take Ethan! When my oldest was 4 we surprised her and took her to the circus. The look on her face the entire show is still etched in my mind. She continued to talk about it for weeks after the show. Now I would love to take her children and see their reaction as I know they will love it just as much. My favorite circus memory is taking my kids for the first time and they watched in awe the whole time.